The head of the United States Commission on International Religious Freedom has said Christians face increasing persecution and marginalization worldwide, and called on governments to urgently step up their efforts to safeguard religious liberty. 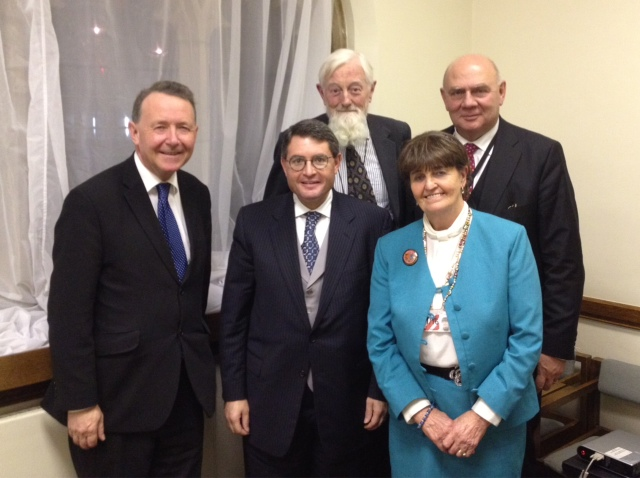 Addressing a group of UK lawmakers at a meeting convened by the Dignitatis Humanae Institute on November 30th, Leonard Leo said the world is facing an uptick in attacks on people of faith. “At a time of increasing marginalisation, discrimination and persecution – especially of Christians – I appeal to the international community to respond robustly to attacks on religious freedom wherever they occur,” he said. After his speech in the Palace of Westminster entitled “Religious Freedom, Sharia Law and Human Dignity,” the US “religious freedom tsar” recalled Pope Benedict XVI’s frequent appeals to uphold this basic right. Responding to his speech, Lord Alton of Liverpool, Chairman of the Cross Party Working Group on Human Dignity, drew attention to a recent report by the charity Aid to the Church in Need which showed that 75 percent of religious persecution is against Christians, mostly in the Islamic world. He also noted the growing marginalization of Christians in the West. “In Britain, Christians face a double threat,” he explained. “Firstly, radical secularism that has forced the Catholic Church to curtail some of its valuable services to society, and secondly a growing radical Islam that is leading to the creation of parallel Sharia laws. This so-called “Sharia Creep” is out to exploit the weaknesses of our value system, increasing the chances of extremist violence. “All of this shows that the USCIRF is needed more now than perhaps at any other time in its history,” Lord Alton said. * USCIRF (www.uscirf.gov) is an independent, bipartisan U.S. federal government commission. USCIRF Commissioners are appointed by the President and the leadership of both political parties in the Senate and the House of Representatives. USCIRF’s principal responsibilities are to review the facts and circumstances of violations of religious freedom internationally and to make policy recommendations to the President, the Secretary of State and Congress. * The Dignitatis Humanae Institute (www.dignitatishumanae.com) aims to promote human dignity worldwide in both political and cultural spheres principally through a growing presence in parliamentary working groups on human dignity around the world. Its basis is the Universal Declaration of Human Dignity, which is endorsed by human dignity working groups in various legislatures worldwide. The document codifies what is meant by human dignity through three main principles: that man is made in the image and likeness of God; that this image and likeness proceeds in every single human being without exception from conception until natural death; and that the most effective means of safeguarding this recognition is through the active participation of the Christian faith in the public square.